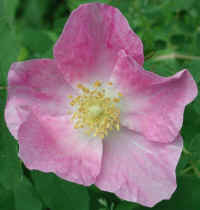 (Wild Rose (Rosa carolina L. ) - 03) We have observed that this type of wild rose bush has relatively few blooms (when compared to the smaller varieties - and that the flowers wither quickly. There are also very few perfectly formed flowers, which is evident in this photo; nevertheless, they are beautiful and fragrant. This is all part of the pleasure of exploring and preserving the wonders of God's creation. It is also a reminder that none of us are "perfect", either, but that we can strive for that perfection. As Jesus tells us in Matthew 5:48, "Therefore you are to be perfect, as your heavenly Father is perfect. "; and in this perfection we will do no harm to each other, or to the animals, or to the environment. (Wild Rose (Rosa carolina L. ) - 01) Just as this wild rose flower has attained near perfection, so can we, and with a similar beauty: a beauty that is more spiritual than physical, a beauty that brings a soothing aroma to God and to the whole of His creation. Such people are the peacemakers of this world. These are the ones whom Jesus refers to as the "children of God" (Matthew 5:9), and of whom Paul says that the whole of creation anxiously awaits to free it from slavery and corruption and pain and suffering (Romans 8:18-25). (Wild Rose (Rosa carolina L. ) - 02) Just as we can look into the "heart" of the wild rose, so God looks into our "heart" and knows our thoughts and the intent of our soul. Do we seek to eliminate the pain and suffering of this world? If we do, then we will stop eating animals and their "by-products", and in the process we will each prevent the most unspeakable suffering imaginable to about 80 land animals a year. May the beauty of the wild rose guide us to becoming and remaining the peacemakers, the true sons and daughters of God, for whom the whole of creation eagerly awaits.